On one of our weekly grocery runs to the supermarket where we bought Mr. Ling Cod Head, among the produce, we were suddenly assailed by a most fragrant smell, so heady and intoxicating. We couldn't quite figure out it was so we walked up and down, around and back, the different bins, sniffing our way through the produce department. Then, there they were, in a small, unmarked box, the objects of our affection: small, yellow guavas with a gloriously big smell. We grabbed several of the guavas and proceeded home to enjoy them. Admittedly, these are not the prettiest guavas on the block. Some of them are beginning to show blotches, but believe you me, they were so delicious. They had a sweet, creamy, custardy flesh with notes of vanilla and passionfruit. This guava-love is new to me. I don't recall eating a lot of guavas growing up. 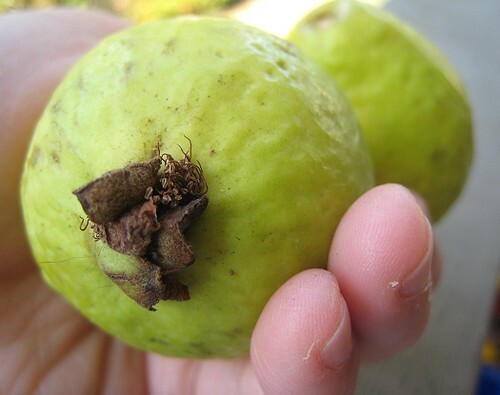 We did have a guava tree in the backyard, but those guavas yielded green fruit with a pinker flesh inside. I remember that I did not like those at all. They were larger and stinkier, the smell as aggravating as when one is stuck in a crowded bus on a hot summer day. Perhaps it was one more unpleasant association: when we suffered from high fever, one of the home remedies prescribed was bathing in warm water with these green guavas. But these, these small yellow ones are nothing like their stinkier cousins! And oh, what a new, exciting love they have blossomed in me! I couldn't get enough of them. TS and I must have devoured half of them by that end of day. We were so excited by the possibilities of the guava and started dreaming of guava applications. We wanted to do a dish with guava and started conceptualizing the dish in between the day's work and errands. Our eureka moment was followed immediately by panic. I was afraid that the guavas at home were not safe. I was afraid that they were all going to be eaten before we even had a chance to make our dish. I called home immediately. CSC answered. Me: Oh hi, CSC. You know, the guavas. Don't eat all of them. All I heard was a laugh at the end of the other line. I was even more scared now. CSC (in between laughs): Oh, there's only 2 left. Me: Okay, don't eat those 2, okay, until I tell you it's okay to eat. So, if we were to continue with the dish we had planned, we had to get more of these guavas. We returned to the supermarket where we got it originally. We walked and walked and walked all around the store and couldn't find them! I had to ask one of the clerks for them and they couldn't understand what I was talking about. Okay, I can take a setback here. We left the supermarket and went to the other supermarket beside this one. We walked and walked and walked and couldn't find any guavas either! I asked a cashier this time, thinking they must know better than the stocking clerks. The cashier couldn't understand what I was talking about, since I couldn't give them the Chinese name for guava. After a couple of futile back-and-forth questions, the cashier finally told me, "If it isn't on the floor, we don't have it." Things were beginning to look bleak. We were trying to figure out where else we could get the guavas. We figure to give it one last try, visiting a produce shop near our office. This store had some interesting produce available, given that they cater to different ethnicities within the immediate area. 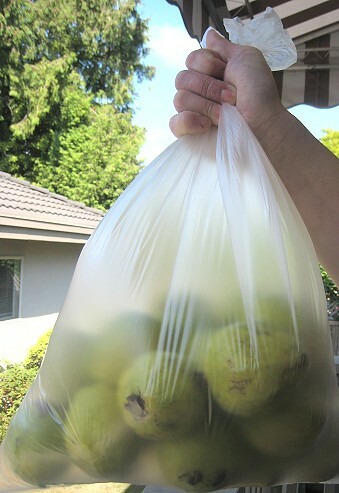 They had the guavas and we bought another bagful. This time, I'm not risking another scare. The guavas we bought this time were still unripe. But, they were still not safe from eating mouths: we're quite used to eating unripe fruits with coarse salt, guava being one of those fruits. 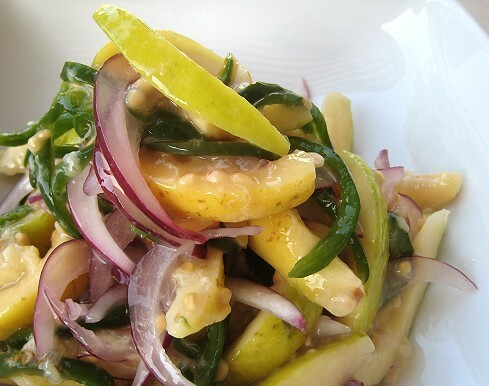 So we made sure to make this Guava-Jalapeño Salad the same day! The salad was easy as can be. I sliced both ripe and unripe guavas into thin wedges. I added thinly-sliced jalapeños and red onions. Some limes were squeezed for juice and coarse salt was sprinkled. We initially conceptualized this dish as having only unripe guavas, so I was afraid of what the ripe guavas would do. 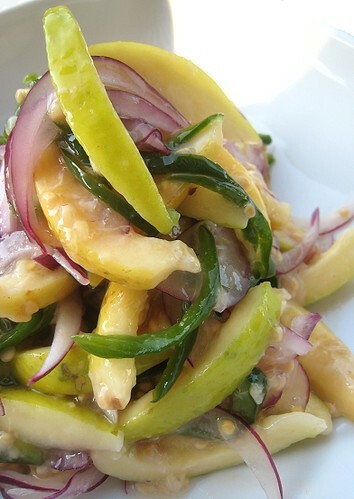 I had imagined the unripe guavas to act as a more flavorful jicama, as a crunchy agent. 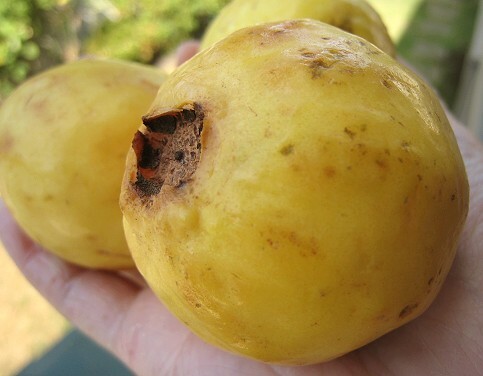 So, when I saw the ripe guavas' custardy insides oozing all over the place, I was scared! I needn't have worried. The custardy insides were a boon to this dish. They acted to bind the salad with their creamy selves. The ripe guavas made their own creamy dressing, essentially. The contrast between the soft, slightly sweet guavas and the firmer, crisper guavas was more than we had imagined. The limes gave this salad needed acidity and the red onions, piquancy/pungency. We added a tad too much japaleños; this was HOT! We have the perfect protein to go with this. So exciting. We served this to accompany Duck Breast with Pomegranate-Chipotle Glaze. If you'd like to participate, see who's hosting next week. 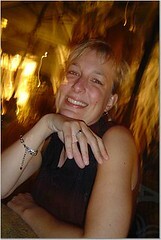 WHB is hosted this week by Katie of Thyme for Cooking. It's not guava season yet so I have not seen any nice guavas around. Guavas and jalapenos sounds like an explosive combination! Its really difficult to get the soft sweet type of guava, you're really lucky! And the salad looks really yummy..
Congratulations dear on winning the perfect party recipe competition. Okay, I'm convinced... If I ever see these cute little yellow guavas I'm buying a sackful... then I'll email you for inspiration! It's really hard to get good guavas in NY. I gorge on them whenever I'nm in Taiwan (sigh, it's been so long). BTW, the Chinese name is Ba-la. I don't believe I've ever seen guava in the stores here though I haven't really looked either. This salad sounds so good I might have to start looking. When I'm in Hawaii I can't get enough guava juice. Those are nice guavas compared to the Taiwanese or China variety that are huge and crunchy but tasteless. I think what you have there is the same variety sold in the Manila. PS. If I may add a suggestion, it is possible for you to put the name of the store where you bought the goodies in your post? Please include the branch as well, ie T&T Richmond, etc. It will save us your avid readers in Vancouver time spent scouring the stores. Um, yea - that's a ton of guava. But that salad looks good enough to sell. I never thought of making guava salad. You have convinced me, it sounds and looks delicious! never have guava cooked !! hmmm how it's taste?.I like my guava with sour plum powder! Great find, and a mouth-watering way to use them. I really love sweet and spicy combos like this, and the colours are just brilliant. Oh I haven't tried yellow ones before ... they look really cute! I don't remember how guavas taste... these are the ones I've tasted in, like, almost 20 years! Haha, OK. In Richmond, basically we go to T&T or Osaka (they're basically the same thing). We've been going to the Richmond Country Farms market as well. I believe they're only open in the summer. The guavas came from Fruiticana (beside Little Ongpin). That does truly sound fun. I don't think I've eaten fresh guava but I've had the flavor in drinks and I like it. Very creative use of it here!